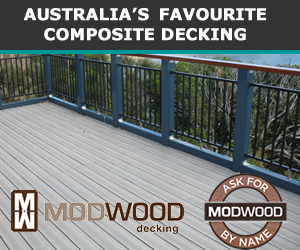 ModWood is the original manufacturer of composite decking in Australia. Launched a bushfire rated BAL-40 decking board named Flame Shield. ModWood won the Victorian Premier's Innovative Products Sustainability Award in 2013 with Flame Shield.ModWood is manufactured from reclaimed wood shavings and recycled milk bottles - approx. 90% of the board weight. The environmental benefits include:- reduces demand for virgin materials, avoids the use of tropical rainforest decking timbers, diverts waste from landfill, does not require painting, staining or oil and manufactured in Melbourne, Australia.